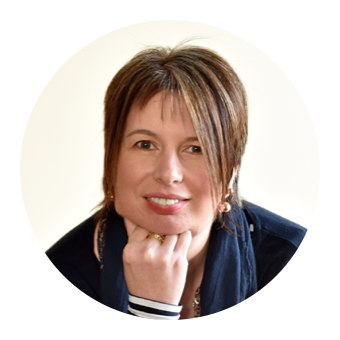 Food and travel are inextricably linked. Every time I go on holiday one of the highlights (OK I admit it, reasons for going in the first place) is the food. I wasn't entirely sure if this would be the case with Iceland but I was blown away by the food. Yes it was super expensive but it was also amazing. 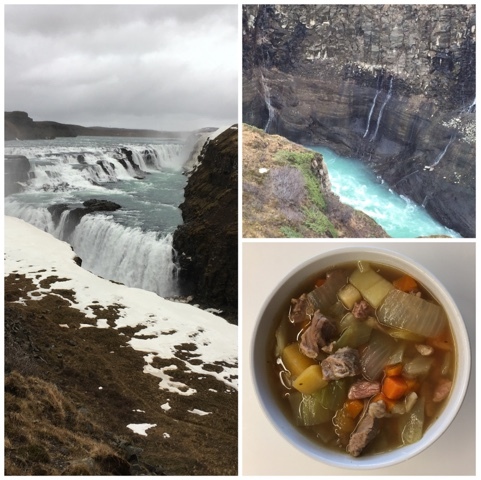 I've already blogged about Where we stayed in Iceland and what we ate in Reykjavik, now I'm going to take you for a trip round The Golden Circle, the island's main tourist route and share my recreation of the Lamb Soup we ate at Gulfoss. 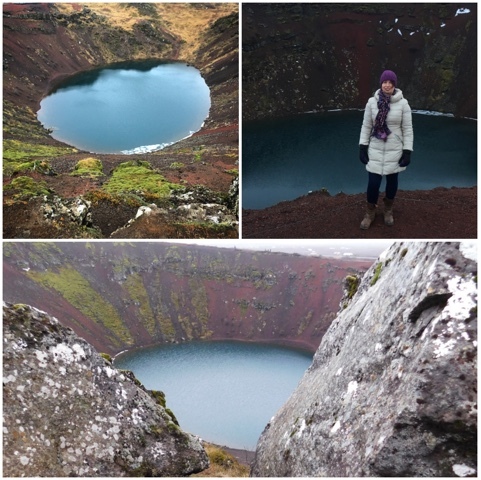 We were completely blown way by the first stop on our Golden Circle journey. Just 5k from our apartment at Hotel Grimsborgir, Kerio is a 6500 year old explosion crater lake. The vivid red rock, colourful vegetation and greenish water make it a spectacular sight. Iceland's favourite pop star Bjork once performed a gig on a pontoon in the middle. Geothermal energy is used to heat thousands of Greenhouses across the whole of Iceland, at night they glow spookily red like a horticultural version of the Northern Lights. 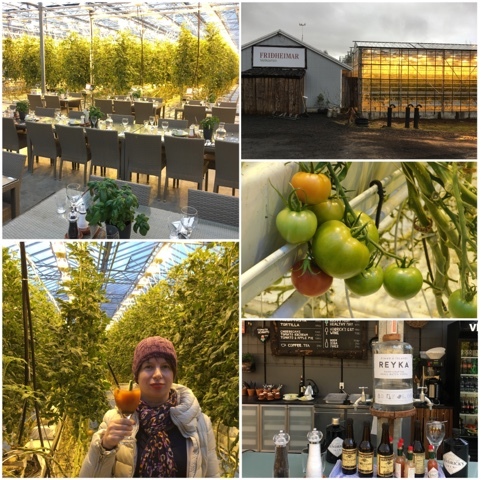 Fridheimar is a truly unique food experience located within a tomato greenhouse. It's a restaurant with a small shop and I'd mistakenly thought we could just drop in and look around but you really need to be part of a pre-booked tour group or be dining. The smell of tomatoes as soon as you stepped in was mesmerising and took me straight back to my Granda Monearn's small greenhouse when I was a child. We'd not long eaten breakfast so lunch wasn't really an option, instead, despite the sun not being over the yardarm, I opted for a Bloody Mary and Foodie Boy had Tomato Ice Cream. Both were absolutely delicious and a return visit for their famous soup would be top of my list for any future trips to Iceland. Geysir is the geysir after which all other geysers are named. Alas the Great Geysir itself hasn't really been active since 1916. Luckily its neighbour Strokkur is happy to regularly oblige to the delight of hundreds of tourists waiting poised with cameras to capture the moment. The furthest point on the Golden Circle is Iceland's most famous waterfall, Gulfoss, The Golden Falls. Its a spectacular two tier plummet of 32m. Alas no sunshine when we visited but it is known for producing spectacular rainbows. Our guidebook told us that the Cafe was famous for its traditional Lamb soup and it didn't disappoint. Made using local organic lamb and vegetables it comes with unlimited bread and butter and a free refill - best bargain of the whole trip! We each managed two bowls. I knew from the first spoonful that I wanted to try and recreate my own version. Girl had a sandwich whilst we feasted on Lamb Soup but I'd promised her that the next stop would be right up her street. 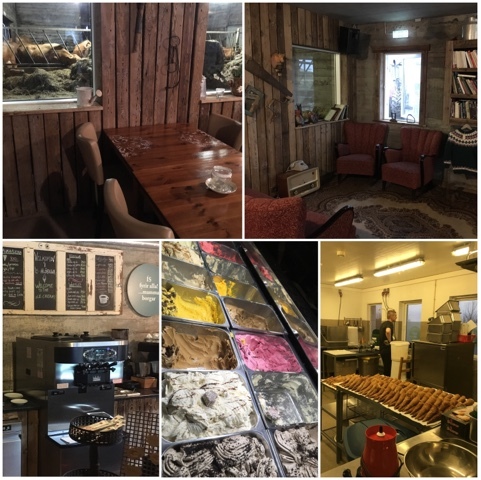 Efstidalus is a dairy farm with a Restaurant and Ice Cream Cafe. You can watch the ice cream and cones being made and from the cafe windows you look right into the cows and calves in the cowshed whilst enjoying an ice cream. Another one I'd love to revisit to try out their restaurant. This was an absolute must do on our trip and didn't disappoint. 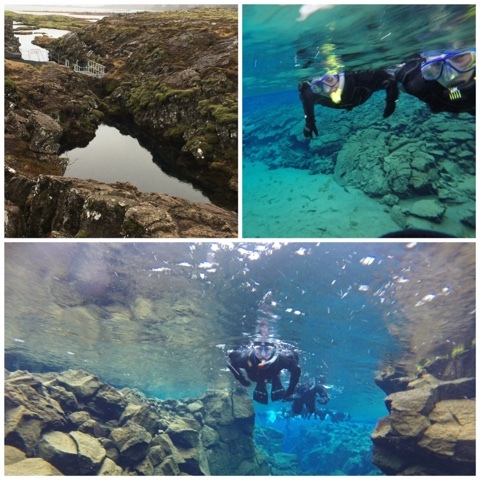 We went snorkeling between the American and European tectonic plates with Iceland Adventure Tours. Getting in and out of the dry suits was an adventure in itself! The water is freezing cold - no geothermal springs here. The snorkeling trip itself takes about 30-40 minutes exploring the big crack, hall, cathedral and lagoon. The water is fantastically clear and the colours are brilliant. Visibility is around 100-150 meters. The water is probably the purest drinking water you'll find in Iceland so we all drank some - whether on purpose or accidentally! The hot chocolate, coffee and cookies afterwards were almost as welcome as tea and toast after childbirth. Now to try and recreate the Lamb Soup. Icelandic lamb is renowned for its flavour and quality - as is Scotch Lamb. 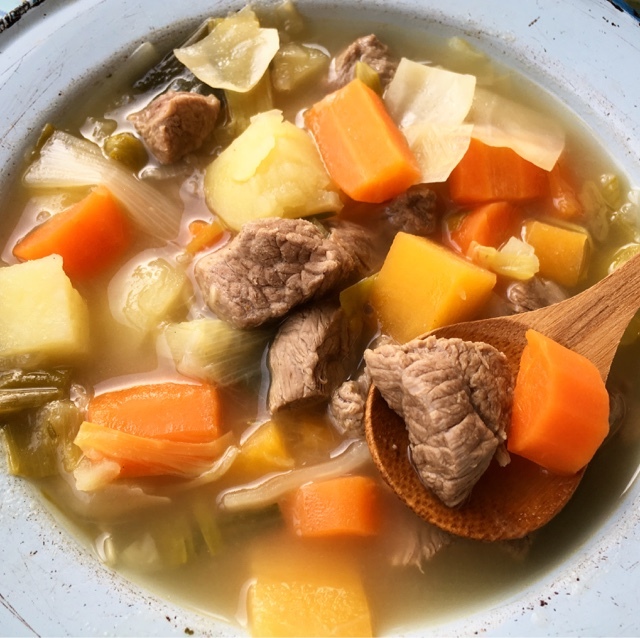 Kjotsupa is a favourite throughout Iceland and apparently every household has their own recipe. The broth was wonderfully flavourful and I suspect that a Sheep Head was used to make it. We saw these on sale in the freezers of all the supermarkets. The vegetables in the broth were really chunky and rustic so I chopped mine likewise. I think it could also work really well with the addition of barley, rice or rolled oats to make a thicker stew. I was really pleased with my version but I'm sure it could be improved with using a freshly made lamb stock (with or without sheep head!) I stirred in some English Mustard to my second bowl which added a nice kick. It's the perfect dish to warm the cockles of your heart. To make my Kjotsupa I used some delicious Organic Scotch Lamb from Wark Farm in Aberdeenshire. Cut the lamb into bite -sized cubes and place it in a large soup pan along with the stock, and the roughly chopped onions and leeks. Bring to the boil then turn down the heat and simmer with the lid on for 1 hour. Add the sprigs of thyme and rosemary and the roughly chopped carrots, potato and swede and cook for a further 20 minutes. Finally add the chopped cabbage, season well with salt and pepper and cook for a further 10 minutes. Remove the thyme and rosemary sprigs before serving with unlimited bread and butter and free refills. Iceland is definitley on my list of places to visit, looks like you had an amazing time. The landscape looks so incredible. 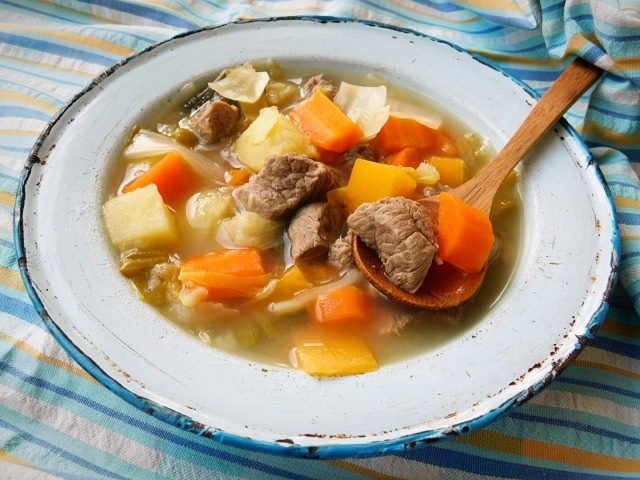 This recipe is SO like Welsh cawl. I bet the flavour is amazing! It was indeed an amazing trip - I'd recommend it to anyone. Someone said on Instagram that they though it sounded very Scottish. I guess there may well be Celtic/Scottish/Welsh/Icelandic connections. I'm not quite sure when Iceland came on my radar but it's had a phenomenal increase in tourist numbers in the last few years. Iceland looks amazing. You did quite a lot when you were there! The lamb soup looks nutritious and filling. We tried to pack as much as we could into the time that we had available as it will most probably be a one off trip. 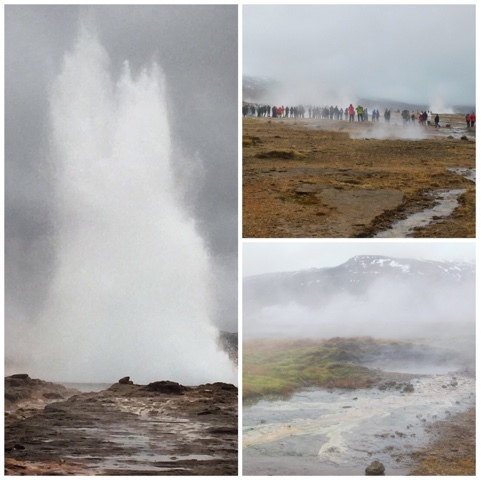 What a fantastic trip, I'd love to see the geysir and the lamb soup looks just the thing to keep out the cold! The geysir was fab. Such a fantastic natural phenomena. The soup was most welcome to keep the cold at bay. This looks like a wonderful trip. And the Lamb soup looks fantastic. A perfect comfort food. It was like a great big hug in a bowl! 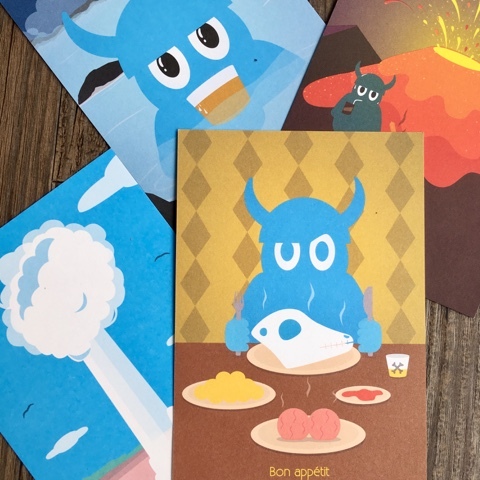 I admit that food is often the main reason behind my travel (though I try to focus on other things, as well). 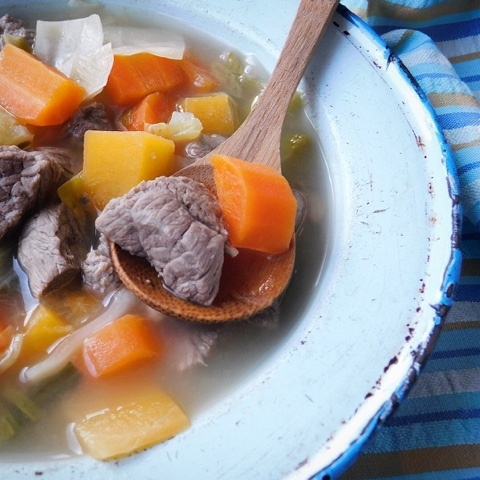 I would love to visit Iceland, and also to enjoy a bowl of this comforting soup. We all need to eat so may as well seek out the local food specialties whilst on our travels. I wish I had some of this soup last week when it was freezing and flooding. Iceland looks amazing. Oh gosh! I hope you didn't suffer too much, sounds nasty. That looks like a bowl of comfort! would be amazing on a cold winters day. Looks like you had an awesome time. Iceland does sound cold!! I think I'm going to steal that phrase. Temp was between 2 and 5 when we were there but it's -14 this week! It's a stunning country but definitely best without kids or with older kids (ours are 12 and 14) Hope you get to visit at some point in the future - meanwhile go and cook up a pot of Kjotsupa and you'll be half way there! Glad to have inspired your future travel plans - start saving now!